Rival gangs, the Jets and the Sharks, agree to a rumble to settle control of their contested neighbourhood. Tony pulls away from the Jets claiming that he values friendship with its leader Riff more than the comradery of being a member. The recently arrived sister of the rival Puerto Rican gang leader Bernardo attracts his attention despite her betrothal to a Shark. Cue conflict, violence, deaths, racism and the potential for a stage full of broken hearts. Music by Leonard Bernstein, lyrics by Stephen Sondheim, and book by Arthur Laurents. 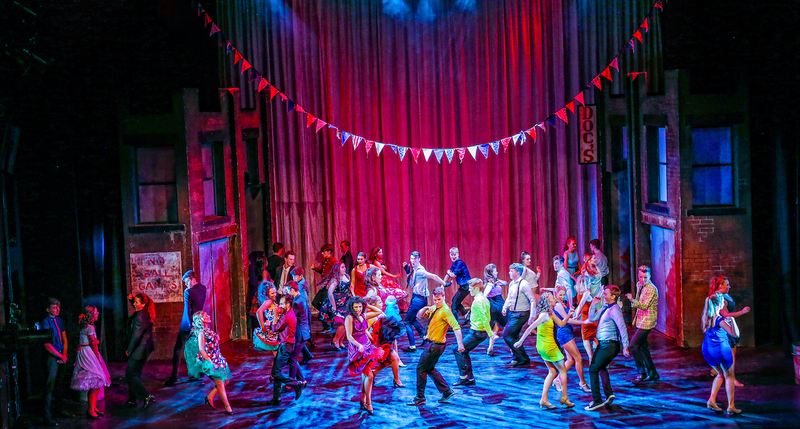 The youthful Belfast Music & Drama Society cast maintain consistent and believable accents throughout the two act production of West Side Story. Alex McFarlane is responsible for the choreography and costumes, both are detailed and exquisite. Gee, Officer Krupke is the standout routine for the Jets, demonstrating the young lads' impeccable coordination with a touch of humour. Wilson Shields has the guts of an orchestra under the Grand Opera House stage with eighteen musicians recreating the classic soundtrack. 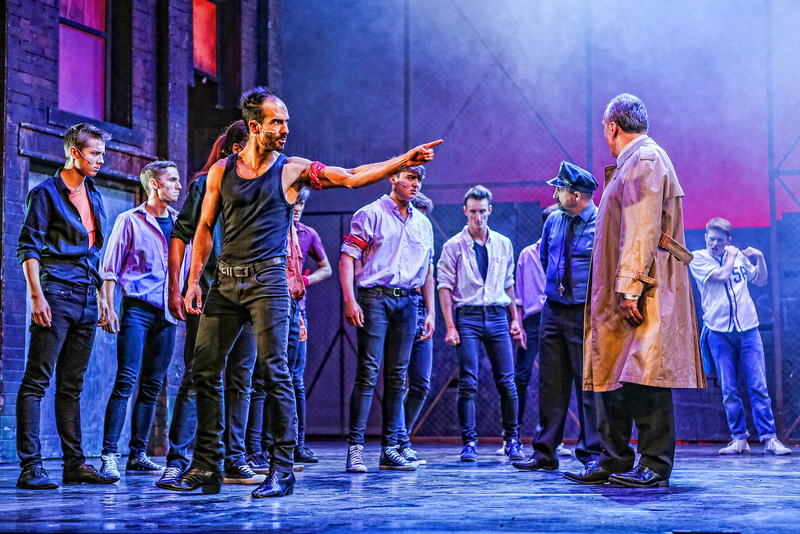 The cast don't let him down with their singing, with a string of iconic songs that keep the roughness of the gang culture without losing the rhythm and harmony of the score. 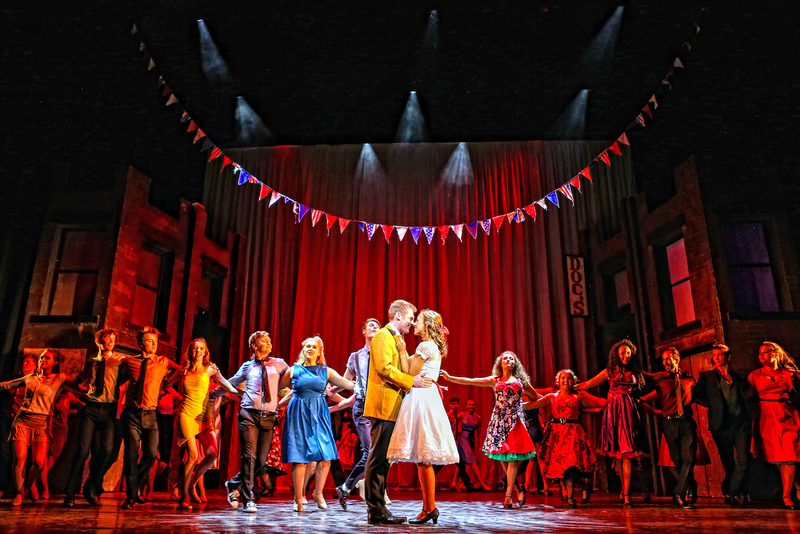 The use of dynamics make Boyd Rodgers' voice stand out as Tony, while Amber Dixon pours emotion into her performance as Maria. While the romance boils up faster than my kettle, the temperature and intensity of their on-stage chemistry is believable. Lauren McCann's tender solo Somewhere during the slightly surreal all-in-white dream sequence deserves a mention along with Naomi Smyth's passionate portrayal of Shark siren Anita. Light and shade is an issue at times between scenes, with joyous performances following on from darker moments that seemingly provoke no sense of despair. 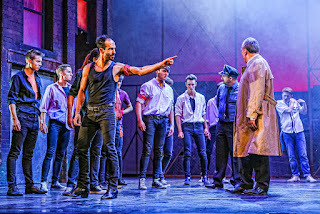 Where the musical lapses out of song into dialogue, the pace tends to be lost: during the run this may be addressed as the production matures. Director/producer Jordan Walsh creates a dark ending, that warrants the 15 advisory that accompanies this production. Yet there's a lack of finality to the last scene which, while dripping with emotion (and blood), feels a little too curtailed when compared with the more stylised curtain call which follows. 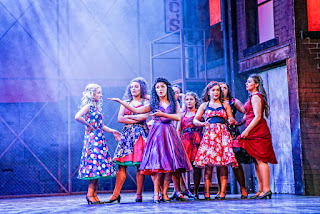 Belfast Music & Drama Society have assembled a young and talented amateur cast to produce a no holds barred version of West Side Story that has colour and flare and does not shy away from the more extreme elements of this sixty year old musical. It's a strong first outing for BMDS on the Grand Opera House stage. West Side Story continues until 10 February with shows nightly at 7.30pm and a 2.30pm matinee on Saturday. 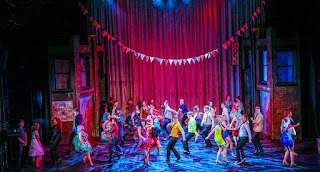 Fabulous production shots by Melissa Gordon.